Deputy director of the HCMC Department of Transport Tran Quang Lam on February 18th announced that the department is scheduled to launch two inland waterway transport routes or river bus routes in June and September to ease traffic pressure for roads. 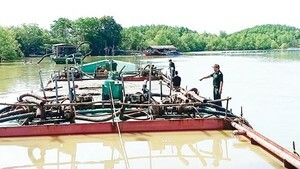 The first route from Bach Dang wharf in District 1 to Linh Dong ward in Thu Duc is expected to open to traffic in June while the second route from Bach Dang to District 8 will come into operation in August. Ticket fare is expected to be VND15,000. The two new routes will be connected with road system so that passengers can catch buses to other destinations in the city from Bach Dang wharf. According to plan, the 11 kilometer first route will comprise seven berths in Districts 1, 2, Binh Thanh and Thu Duc. Boats will depart from Bach Dang, travel along the Saigon river, across Thanh Da canal and end at a wharf in the Binh Quoi river, Linh Dong ward, Thu Duc and vice versa. The 10.3 kilometer second one will start from Bach Dang to move along the Saigon river to reach Ben Nghe canal and stop at Tau Hu canal through districts 1, 4, 5, 6, 8 and vice versa. The two routes will be equipped with 10 modern boats having the minimum capacity of 60 passengers each and traveling over the distance of 11 kilometers within half an hour. They are estimated to transport about 5,000 passengers a day. Investor is a private firm under BOT (Build-Operate-Transfer) contract.